On Tuesday, for the first time in the five years I have been writing this blog, I did a post I would like to take back. (But in the interest of the public record, and because there were several comments of value, I’m leaving it up.) This is the post that I should have written the first time. If they are 30 or 40 percent of units, and nobody I know has read any, does that suggest a cohort of people who really prefer indie ebooks and read them in big numbers? And if indie readers form a “separate” market, is it growing or is it static? In other words, do indie ebooks draw on a particular pool of readers, so that we have two separate competitions going on for eyeballs and ebook sales? We note a piece this morning at Good EReader that calls for the segregation of the self-published titles at ebook stores, because their sheer number interfere with discoverability for publishers’ books. That’s bound to be an unpopular idea in many quarters, but it is something that could happen if any one retailer offers it as a choice to consumers (which is the way to do it: as a filtering choice, not a hard-wired default). If consumers liked it in one place, the practice could spread. Regardless of whether there is one competition for readers for all books or separate ones for indies and publishers, wouldn’t we expect the flood of titles to make it harder for everybody to make sales? (This is a point that Peter Turner brought up in the comment string to the prior post.) Chances are, yes. And that could mean even more authors will be forced to go indie because publishers are likely to respond to a shrinking market and more challenging discovery by reducing their outputs. But it is also true that more challenging discovery means more skill doing it and more tools to reach customers have value. So the ability of established publishers to have “better odds”, to get their books to rise above the “noise” of a large title output, should improve (relatively) over time. Coker did a great service to all of us putting the ebook sales indies achieve into a larger perspective. And, in doing that, he might even have understated the current case for their importance. What Coker did was point out that the 15% ebook dollar share for indies was within the estimated 30% of the market that is ebooks, 70% still being print. Doing math with his share number, he concludes that self-published ebooks are taking 4.5% of the dollars in the overall market. I’d put them at somewhere between half and two-thirds of that. But, in fact, the 70% of the market that remains print contains a lot of titles that have very little, even no, ebook sales at all. These are illustrated books or reference books or even kids’ books that have not worked commercially in a digital version. We don’t know how much of the 70% of books that are print are “readerly” books that are equivalent to the 30% that sell in ebooks, but it isn’t nearly all of them. I think it would be conservative to assume that non-readerly books constitute 25% or more of the 70% of the market that is print, which would divide that portion of the market to be 52.5% books that have commercially viable ebooks (the 30%) and 17.5% books that don’t. So the 30% ebooks overall is really more than 35% for the books that are real ebook candidates (and probably nearer 100% for most of the indie ebooks which would have limited or no print sales). In other words, the ebook share for the books that can work as ebooks is already a bit bigger than an overall summary would suggest. But, despite that, indie ebooks are somewhere in the low single digits as a percentage of industry revenue. There are two big questions going forward. 2. For any individual author, how does the decision of whether to do it themselves or sign with a publisher look? On the first, I think one key question is whether we now have a bifurcated market: one group of people reading the bulk of indie books and another group reading the bulk of published books. There is certainly reason to believe that we do, although this is something that only the retailers really can know for sure. I believe we do have two markets. Part of that is genre-driven. Many readers who habitually consume romance, thrillers, and sci-fi have found less expensive digital-first and author-published alternatives perfectly satisfying. They read lots of units. So it is likely that a concentrated cohort of readers is responsible for a big chunk of the indie books. If that is the case, then indies compete with indies more than they do with publishers. And since we believe that a big part of indie sales growth will be driven by indie title growth, it could be that the sales will have trouble keeping up with the titles. That would mean the path to success for each individual indie author would get harder. Note that this would not affect a self-published author who had built a name and a brand by being published first, except to the degree that self-publishing gets handled differently by retailers or that discovery metadata is not as professionally produced. In general, the distinction between authors who had publisher help building their brand before going indie and those who created success from a standing start has not been underscored as much as it should be in these discussions. And that leads us to the second point. As Coker has pointed out in his piece and in the comment section of my previous post, some authors like to have “control” of their process. As print books become less and less important, those authors have more and more inherent reason to be attracted to a self-publishing model. I believe that those authors who like “control” are already more ubiquitous in the self-publishing world than in the overall population of commercially-capable writers. It stands to reason that they would be early adopters of the digital self-publishing opportunity. My hunch is that most authors want to write, and to let publishers handle their business. They don’t want to do the administration and marketing work necessary to self-publish. And that’s even before they get to the difference between getting paid in advance for a book and having to spend money to put a book out. But it is also true that the deals we see today are not necessarily forever. 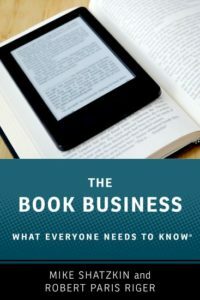 Publishers have held the line on 25% of their revenue as the author ebook share (apparently with some limited exceptions and, of course, situations for big authors where unearned advances effectively deliver higher royalty rates on everything). If they have to raise royalty rates to keep authors, they probably will. E-only publishers and digital-first imprints at traditional houses are already establishing new standards. Amazon just reduced the author take through their Audible subsidiary. Will the day come when they decide to take a bigger share of indie author ebook sales? Why not? Authors will have a shifting set of commercial propositions to consider, along with their personal preferences for “control” or “help”. And that’s before we get to other things not reflected in any comparison of what they earn from a self-published ebook versus a publisher’s ebook: print revenue, unearned advances, and having somebody else doing a lot of work on your behalf. So while I largely agree with Coker’s 10 trends that will lead to enormous growth in the number of indie-published ebooks we will see, I think a grain of salt is needed about how economically significant they will be either for the industry at large or for the vast majority of individual authors following that path even though they are bound to grow quickly. It turns out that the previous post started out with a misunderstanding that led me (and therefore my readers) on a wild goose chase but, in the end, the headline message was right. Even over the next few years, the changes we’ll see around how authors get their work to their readers are more about evolution than revolution. As it happens, The Great Debate at the London Book Fair is about whether big publishers or small publishers will “win” over time. Ken Brooks of McGraw Hill Education and I have the “big” side; Stephen Page of Faber and Scott Waxman, who is both a literary agent and owner of an ebook publishing house called Diversion, tout the “small”. Michael Healy of CCC moderates. If you’ll be at LBF, check this out.